Okay, anyone who comes here just for Maggie and Calvin stuff, leave now. This is a completely self-centered post, with no cute pictures of the kids. No cute stories either. Just a sad story and disturbing images. As you probably remember, I recently posted a picture of my feet and Calvin’s feet in our lovely, one-of-a-kind (two-of-a-kind?) hand-knit Annie Grook socks. Those socks are literally my favorite socks in the entire universe. They might even be my favorite article of clothing. When I am sad, I put these socks on to help me feel happier…that’s how good they are. Other than myself, Annie Grook is probably most aware of my love for them as I went through a period where I constantly bothered her, trying to score more hand-knit socks for myself. I finally came to the realization that these were going to be the only socks I got for awhile, and resigned myself to wearing another pair of sub-standard socks while these were in the wash. Anyway, the point is, I REALLY like these socks. MY PRECIOUS SOCK HAS A HOLE IN THE HEEL!!!!!! This is not okay. I was having a bad evening, and went to put these on for comfort, and this hole is what I saw. I actually started to cry a couple of times because it was so sad. My sister-in-law spent a LOT of time making these, and now they are very sad. 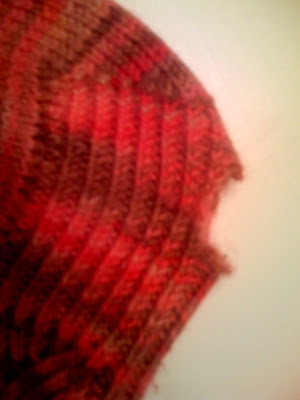 I debated whether or not to blog about this, because Annie Grook has her plate full…overflowingly full…with knitting projects, and I don’t want to pressure her too much. However, it really is just too sad to not post. Poor socks. Poor feet. Okay, I feel a little better now that I have shared my sorrow. Thanks for mourning with me. You’re right. That’s extremely depressing. But I will try to fix them! Never fear, the sock surgeon is here! What a fabulous tribute to the gift of socks though! 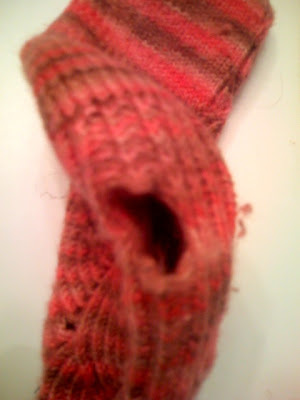 Honestly — every giving of knitted socks hopes that they get worn so much they wear out. And I have full confidence that the Sock Surgeon can repair your socks as good as new. wahhhhhhhhhhhh! I am sad for your loss. seriously! that stinks!